∫ Painter Marge Hanna — local artist reception: Amsterdam Free Library, 28 Church St., Amsterdam, 10:30 a.m.
∫ Artist designed-decorated tabletop holiday trees exhibit: Micropolis Cooperative Art Gallery, 30 N. Main St., Gloversville. Work also on display includes a “Charlie Brown tree” of handcrafted ornaments, paintings, drawings, photographs, fiber art, batik, mixed media, woodwork, glass, digital art, sculpture, jewelry, pottery and poetry. Gallery hours: 8 a.m. to 7 p.m. Monday-Friday; 8 a.m. to 5 p.m. Saturday; and 9 a.m. to 4 p.m. Sunday. The runs through Dec. 31. For more information, go to www.MicropolisGallery.com. ∫ 2017 Fall Art Show: The Art of Disguise: Paul Nigra Center for Creative Arts, 2736 Route 30, Gloversville. Artwork exhibit by local and regional artists. Admission: Free. Viewing hours: 9 a.m. to 6 p.m. Monday-Friday; 9 a.m. to noon Saturday. The show runs to Jan. 10. ∫ Sean Rowe in concert: The Revival, 1441 Route 30, Wells, 4 p.m. $25 at the door. ∫ Soroptimist International of Fulton and Montgomery counties 36th annual craft fair: Gloversville Middle School, 234 Lincoln St., Gloversville, 10 a.m. to 3 p.m. Includes hand crafted items, giftware, over 100 crafters, bake sale, raffles, food concession. $2 per person entry fee; free for children ages 12 and under. ∫ Annual chocolate festival and Christmas faire: Mayfield United Methodist Church, 19 N. Main St., Mayfield, 9 a.m. to 3 p.m.
∫ The Ody Show: Lakeside Tavern and Marina, 306 Woods Hollow Road, Gloversville, 5:30 p.m. No cover. ∫ Tom, Andi and Chad: Partner’s Pub and Grill: 21 S. William St., Johnstown, 7 p.m. No cover. ∫ Annual concert to honor St. Cecilia: St. Cecilia’s Church, 26 Broadway, Fonda, 7 p.m.
∫ New Whiskey River Band: Gloversville Moose, 140 E. State St., Gloversville, 8 p.m. No cover. Open to the public. ∫ James and the Giant Peach Jr.: The Colonial Little Theatre, One Colonial Court, Johnstown, 7 p.m. Tickets: $15 for adults; $5 for children ages 12 and younger. Call (518) 762-4325 to reserve. ∫ James and the Giant Peach Jr.: The Colonial Little Theatre, One Colonial Court, Johnstown, 2 p.m. matinee; and 7 p.m. Tickets: $15 for adults; $5 for children ages 12 and younger. Call (518) 762-4325 to reserve. 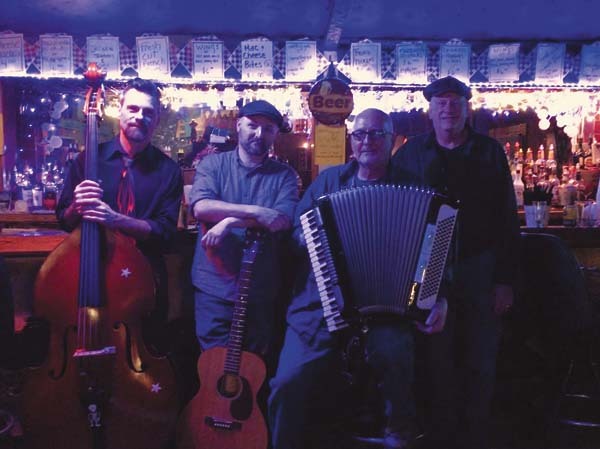 ∫ The Refrigerators: The Glove Performing Arts Center, 42 N. Main St., Gloversville, 7:30 p.m. Doors open 6:30 p.m. Admission: $10 online; $12 at door. To reserve tickets: Call (518) 773-8255, Ext. 25; online at www.glovetheatre.org; or at the door. The concert will be a club setting and beer and wine for purchase along with the concessions. ∫ James and the Giant Peach Jr.: The Colonial Little Theatre, One Colonial Court, Johnstown, 2 p.m. matinee. Tickets: $15 for adults; $5 for children ages 12 and younger. Call (518) 762-4325 to reserve.